Missouri S&T professor Mohamed ElGawady, center, and S&T students are studying making concrete with fly ash instead of Portland cement. Portland cement has been around for more than 250 years as the binding material for concrete, mortar and stucco, but a Missouri University of Science and Technology researcher is studying ways to make concrete without the traditional material. 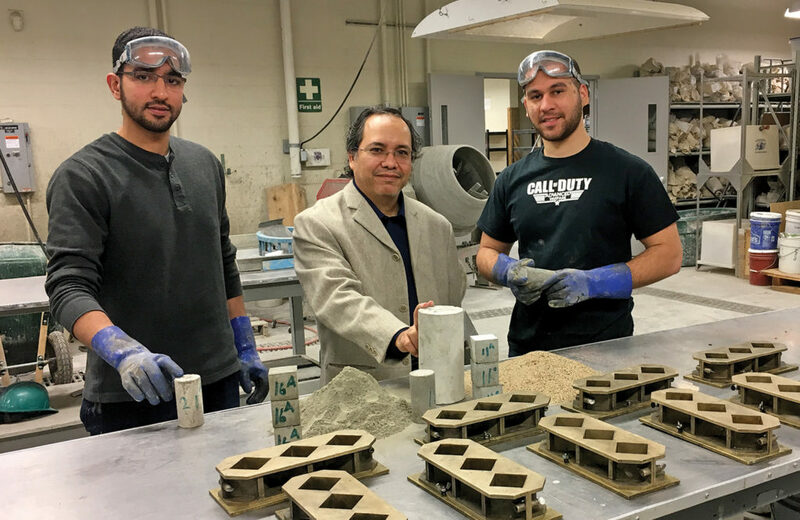 Dr. Mohamed ElGawady, associate professor of civil, architectural and environmental engineering at Missouri S&T, is testing mixtures of concrete made with fly ash that can be more durable, strong and resilient than concrete using ordinary Portland cement (OPC). Using zero cement (ZC) concrete is expected to improve the durability and performance of Missouri Department of Transportation (MoDOT) concrete bridges and extend their useful service life beyond the typical 75 years, ElGawady says. Using zero cement concrete will also improve the sustainability of MoDOT structures. The mixtures that will be developed as part of the study will allow MoDOT to use ZC concrete to address shrinkage cracking and freeze/thaw damage that is currently experienced with conventional concrete mixtures. “The superior durability of zero cement fly ash means also less potential maintenance and repair,” ElGawady says. The goal is to develop zero cement concrete mixtures that can be used by MoDOT contractors for bridge deck and girders using locally available material. The feasibility of using ZC concrete for partial depth deck and prestressed girder repair works will be explored, too. The test will make up to 3,000 samples that have different sources of fly ash, different alkaline activator properties and concentrations, curing temperature variances, different curing times and water content. Conventional concrete mixes use OPC or OPC and fly ash as the main binding material and involves slow process of hydration of the OPC/fly ash, ElGawady says. Additionally, conventional concrete requires curing and reaches its compressive strength typically at 28 days. ZC concrete combines an alumina-silica rich material such as fly ash, calcined clay, mine tailings or blast furnace slag with alkali activator such as sodium hydroxide, sodium silicate, potassium hydroxide or potassium silicate. ZC concrete involves substantially quick chemical process where the alkaline liquid polymerizes the fly ash, creating a new three-dimensional strong inorganic polymeric chain, ElGawady says. So ZC concrete reaches its compressive strength in less than 24 hours versus 28 to 56 days in the case of conventional or high-volume fly ash concrete. ZC concrete experiences very high resistance to freeze/thaw, corrosion, elevated temperatures, fire, salt and acid or alkaline environments. ZC also shows very low permeability and high tensile strength. Hence, ZC is more durable than conventional concrete, ElGawady says. And research by the Alaska Department of Housing showed that making ZC is cheaper or equal to the price of conventional concrete while ZC concrete has much higher durability and performance. More research will investigate the production of ZC concrete with locally sourced materials to determine the best practice to produce ZC concrete with the desired workability without jeopardizing strength. The effects of ZC concrete on the bond between the concrete and rebar will be investigated, as well. Finally, because ZC concrete maybe used for retrofitting purposes, ElGawady will try to determine the cohesion and friction between existing OPC concrete and ZC concrete.